A dissertation proposal is an academic paper that is usually written to give readers more information about your dissertation. It lets the students, instructors, and other people find out what your dissertation will be about, what questions will be examined, what is the theoretical background for your paper, what methods will be used for it, and how students and researchers will use the results of this dissertation. The structure for writing a research proposal may vary. It depends on the size of the paper, the course, and other specific requirements. Students usually write such proposals before writing their dissertations, which is quite convenient because, your proposal is almost your first draft which helps form the opinion of your instructor and get advice from him or her. The feedback from your instructor can help you avoid mistakes in your dissertation. It is better to fix these mistakes before you start writing your first chapter. If you notice them when main sections of the dissertation are ready, it would take much more time to fix and thus, you risk either missing the deadline or failing the task. 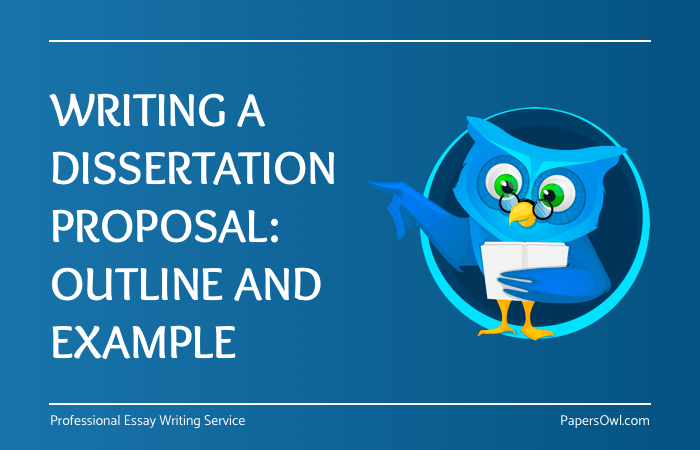 The proposal allows you understand your goals that should be reached through writing the dissertation. If you keep all your goals in mind, it would be much easier to develop a good structure for your paper, make the dissertation proposal outline, and find the right direction for dissertation. It is also helpful for students who have never written such tasks before. While this is a good a starting point, some are just unable to handle it and if you see that you can’t complete your paper on time and obtain a high level of quality, you can use a dissertation proposal writing service to avoid risks. What Does A Dissertation Proposal Include? There are several parts that are used in dissertation proposals but the structure can be different and that is why you should not use the first structure from examples you see on the Internet, but choose a structure that is the most suitable for your paper. Make sure you have the main sections that help you show the basic points of your paper, goals you are going to reach, methods you are going to use, and such sections as Literature and Bibliography. Introduction. Most academic papers usually start with this section. You can use it to demonstrate the background of the topic to your readers, provide a thesis statement, objectives of your study, and you should also outline questions that you are going to answer in your dissertation research proposal. If you want your thesis to make an impact, your paper should be significant for science. You may describe the significance of your study in the introduction. You should also put the Definition of Terms, Limitations, Delimitations, and other similar sections into your introduction or close to it depending on your professor’s requirements. Review of the Literature. In this section, you should provide the basic review of the literature and other data sources that you are going to use when writing your paper; students often put the Search Description, Framework, and Review of Research into the Review of the Literature section. Methodology. The structure of this section can be different, except for its beginning and ending. You can start it with the Introduction, set Research Design and Questions, describe the Setting and participants of the study, provide information on Data Collection and Analysis, and finish it with the conclusion. There can also be such sections as a Research Hypotheses, and Setting and Sample. Research findings. This section helps you show what information you already have and are going to use for your paper – make sure you organize your findings list in accordance with the research objectives given in previous sections. Conclusion. The conclusion can include the summary of your thesis proposal. It should also contain conclusions based on your research and organized in accordance with the introduction; this section can contain the discussion of your work and provide suggestions for future research. You can use this basic structure for writing dissertations for different subjects. Don’t forget to proofread your paper before sending it to your instructors and check its grammar, and, if there are any requirements given by your teacher, you should follow them to get good results. There are many examples of such papers. However, not all of them are useful for you so you will need to make sure that a PhD proposal example you use has the right structure and also has similar requirements. For example, if you need to write a proposal for a dissertation on a Computational Model of the Acquisition of Intellectual Expertise – then you have to start from the title and note the name of your university. Here, you can give a summary of your paper as well as your goals and objectives. Despite the size of the paper, its abstract is usually small and helps your readers understand what your project is about within a short time even if it has many pages. What is Intellectual Expertise? In this section, you let your readers understand the most used scientific terms and provide them with a concise history of the subject of your research and the works of other scientists related to it. The Description of the Model. In this section, you can give basic information on the structure of your system, a role of different nodes, and what Design and Training methods you use. Note that this example is good for studies in Cognitive Science. However, it can be quite different for other topics.